This lavish record of the eventful decades surrounding the Civil War explores a divided nation through the personalities of its growing and ideologically diversifying populace. Lincoln emerges as the iconic celebrity of the era’s central conflict, but the real stars are the supporting characters. Politicians, poets, slaves, slave holders, transcendentalists, Mormons, women’s suffragists, and Native American chiefs are just some of the colorful characters who run the gamut from “prolific and daring and conventional” to “spare and iron-willed” and “excessive and homegrown.” Acclaimed biographer Wineapple (White Heat: The Friendship of Emily Dickinson and Thomas Wentworth Higginson, a finalist for the National Book Critics Circle Award) gracefully choreographs a staggering number of primary sources, weaving disparate voices together into one revelatory thread. 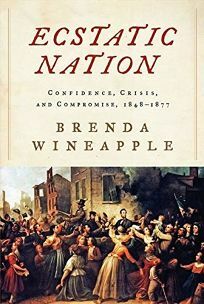 In her depiction of the bloodshed of the Civil War, she eschews “statistics [that] defy comprehension,” focusing instead on specific scenes and personal stories that capture the magnitude of a pivotal moment before fleshing them out with analyses of contemporaneous reactions. The result reads like a series of biographies-in-miniature, a marvelous survey of both familiar and unsung American stories, contextualized and framed within one sweeping canvas. This is sure to enrich any reader’s understanding of the complicated history of Civil War–era America. Agent: Lynn Nesbit, Janklow & Nesbit.